Great to see Arthur Conan Doyle included in an all star line-up for the Edinburgh Fringe Festival. Ann Treherne presents 'Arthur Conan Doyle - The Spiritualist' over a series of five talks hosted at The Arthur Conan Doyle Centre, Edinburgh. The Conan Doyle Family, through The Conan Doyle Estate's website profile 'The Man's' "unshakable and sincere belief" as a spiritualist (explore here). With four sell-out shows behind her, Ann Treherne, Chair of The Sir Arthur Conan Doyle Centre talks about Edinburgh's famous son and man of literature who became the world spokesman on spiritualism. 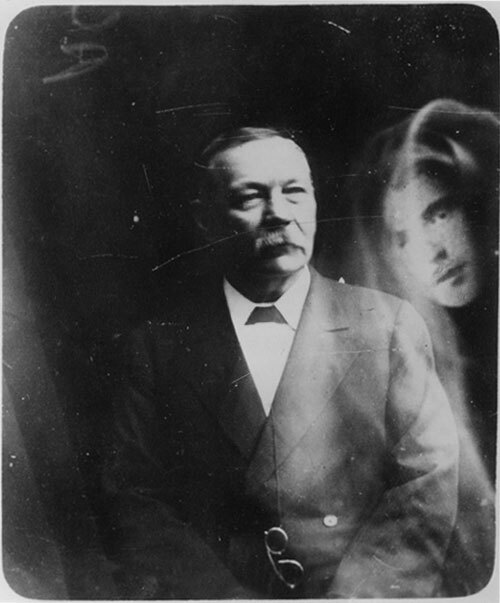 Famous author of Sherlock Holmes, Arthur Conan Doyle himself became an investigator, but of psychic phenomena. Famously declaring himself a spiritualist and dedicating his life to its cause. Ann will explore his early life in Edinburgh, before he was famous, and explores the early stirrings of a lifelong interest. Ultimately, she will explain why the centre bears his name. The Edinburgh Festival 2017 Source.